(09-09-2013, 09:29 PM)Mariana13_Tay link Escreveu: [ -> ] Quero, preciso de ouvir!! É me um pouco indiferente essa noticia porque não era algo pelo qual ansiava. Parece que vai haver uma surpresa!!! Então sempre deve ter havido o dueto ao vivo entre a Taylor e lá o actor do filme. 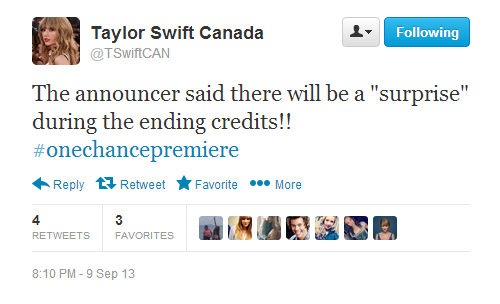 (09-10-2013, 10:10 AM)PocasNuckie link Escreveu: [ -> ] Então sempre deve ter havido o dueto ao vivo entre a Taylor e lá o actor do filme. Acho que não porque dizem que a surpresa seria no durante os crédito finais e nessa altura toda a gente já sabia que ela lá estava por isso não é surpresa nenhuma. James Corden a falar sobre a Tay! Citar: …Yeah I have known her for awhile. I’m a good friend of an ex-boyfriend of hers [Harry]. So we get on very well. I like her very much. Yeah, I have known her on and off for awhile. I think she’s lovely. It’s so thrilling how she’s supporting our film. It’s one thing her doing a song but another for her to say, ‘No no no, I’m flying to Toronto.’ Bc she knows how her presence gives us a lift and we are incredibly grateful to her for that. Ao que parece a Tay andou ontem a correr por Percy Warner Park! Citar: @1075theriver: YAY! Anymore TSwift sightings? RT @ncwinchester: I just saw @taylorswift13...in person while hiking. She grinned at me. My life is complete. @_michaeldavid: “@1075theriver: YAY! Anymore TSwift sightings?" She cranky today, gettin' her run on at Percy Warner! ?